This was once just a page that contained my public encryption key. It has now grown to become an introduction to how and why to use the GNU Privacy Guard encryption software (GPG) to protect your privacy. It is continually growing. If you have questions, corrections, suggestions, software recommendations, or want to exchange encrypted e-mails, please contact Alan Eliasen. I'm also on the Twitter thingy as aeliasen. Thanks! "Creating the perfect GPG keypair"
Below is the public encryption key for Alan Eliasen, (eliasen@mindspring.com) in armored OpenPGP format. This lets you write encrypted messages that only I can read! Note: I have recently upgraded to a stronger 4096-bit RSA key. If you were previously using the old key, please see my key migration document for more information on the reasons for this change and how to migrate to the new key. Don't worry: you don't have to read this. You can cut-and-paste it or obtain it in a plaintext file or import it from a keyserver using the directions in the Importing a Key section of this document. This is also available in a plaintext file. In short, public-key cryptography solves the age-old problem "how do I communicate with someone securely without somehow exchanging a secret password first?" Exchanging a shared password securely is a hard problem. You may have no way to do so if your communications are monitored. With public-key encryption, instead of sharing a password, each party generates a "keypair" consisting of a "public" key and a "secret/private" key. Each party can then publish their "public" key to the world or send it directly to the other party, while keeping their secret key private and safe. Validate that Person B signed a message with their secret key. This also lets you verify strongly that the message was not corrupted nor modified in transmission. Decrypt messages encrypted with your public key. I accept and transmit all messages using the OpenPGP format, which is an open standard, (RFC 4880) and the most widely used standard for public encryption, so communication should work with any OpenPGP-compatible program. Thunderbird, mozilla.org's stand-alone mail client. After installing or updating in Fedora, you may not see the OpenPGP menus in Thunderbird until going to Tools | Add-ons and then disabling Enigmail, restarting Thunderbird, re-enabling Enigmail, and restarting Thunderbird. My main gripe is that Thunderbird changes version numbers rapidly and Enigmail sometimes doesn't keep up, which makes Enigmail claim that it's incompatible with your Fedora version. This is an important reason to use a package-manager like dnf on Fedora which tends to keep them in sync. This is another reason it's good to know how to use the gpg executable manually. The first thing you want to do in Enigmail is to make all of its settings visible. You can do this from the menu items Enigmail | Preferences | Display Expert Settings and Menus. The basic settings are inadequate. Note: As of the latest update of Enigmail, around July 2014, the text used in several menu items has changed. The old top-level menu item was called OpenPGP and the new one is called Enigmail. You may need to mentally correct these examples if you're using an old version of Enigmail. The Gnu Privacy Guard FAQ lists some of the other e-mail programs compatible with GPG. Note that you can use any e-mail program (that doesn't corrupt messages) along with the gpg executable on the command-line. Alternately, I sometimes use the pgg package in Emacs/XEmacs which is a wrapper around the gpg executable's functions. You can do something like highlight a region and do: M-x pgg-encrypt-region and encrypt directly within your documents. For encrypting files, or doing anything more interesting, I just use the gpg program on the command-line. If you're security-paranoid, the fewer executables, the better. Most of this document teaches you the fun and important things you can do with the gpg program to be secure. The developers of the Android K-9 Mail application recommend "Install the app OpenKeyChain: EasyPGP to encrypt/decrypt your emails using OpenPGP." Although I use K-9 Mail, I have not tried OpenKeyChain and I can not vouch for it. On Android, you may want to experiment with R2Mail2. I haven't used it and can't vouch for it. There is also Android Privacy Guard (APG) (no longer linked here; see below), which integrates with the K-9 Mail program, but I do not vouch for it. APG was not updated for several years, but has seen activity more recently. Warning: This is why I don't trust APG. If I were some corrupt actor, I would look for some cryptography package that nobody has updated for a long time and offer them a bunch of money to buy out and corrupt and back-door their package. This is exactly the model of a product I wouldn't trust. GPG version 2 may be on your system with the executable name gpg2 . Either executable can be used for these demonstrations. Both are mostly compatible with each other. (If you want to know a million different opinions on which you should be using, do a web search.) Version 1 is more tested, and is usually a single monolithic executable. Version 2 is compiled with crypto libraries like libgcrypt externally linked, and is designed to work better with external password entry tools. That is, gpg2 is designed for graphical environments, while gpg works better for automated and command-line use. From the command-line, I use version 1. These elliptic-curve algorithms are not contained in gpg. If you attempt to communicate with people who only have elliptic-curve algorithm public keys, you will not be able to import their public keys with gpg, and you may need to use gpg2. In general, it is believed that elliptic curve algorithms require shorter keys for the same level of security as, say, RSA keys. I will go out on a very solid limb and say that the length of keys is not very important in the contexts where GPG is used, because a public key is only imported once, and the length of the key in this context matters very little. Nor does the time taken to decrypt an e-mail. (Key length only really matters when you're contacting, say, lots of websites and milliseconds and hundreds of bytes matter.) If it takes even several seconds to decrypt, it's usually not important in the context of GPG. If you encounter this case, then gpg likely did not import the public key correctly, and you will need to try to use gpg2 to import the public key. (For me, gpg2 could import public keys that gpg could not.) It appears that, once you have correctly imported the public key, you may be able to use gpg or gpg2 to communicate with the other party, depending on the particular feature that was requested. By the way, at this point, I neither endorse nor discourage use of Mailvelope. I have used it to apparently encrypt communications correctly with GMail users, though. The simplest way to import my key from an e-mail client (like Enigmail) is to import it from a keyserver. In Enigmail, you can search for keys using the menu items Enigmail | Key Management | Keyserver | Search for Keys, and then searching for my name or my e-mail address eliasen@mindspring.com or my key ID, which is 5F2B4756ED873D23 or the shorter ED873D23. Then select its checkbox from the list and click "OK."
A lazier and more dangerous way to import my public key from Enigmail is to try and send me an encrypted e-mail. (When composing a message, choose the menu item Enigmail and select both Sign Message and Encrypt message.) Then, when you try to send, Enigmail will realize that it doesn't have my public key, and will bring up the Key Management window. From there, you can choose Download Missing Keys. Another way to import my key is to e-mail the plaintext version of my key to your own e-mail address and choose the option like "Import PGP Key." You can browse the keys available on keyservers at pgp.mit.edu or the often-slow sks-keyservers.net. Who do you know who has a posted public key? Note that in all of these examples, whenever you see an e-mail address, you can usually substitute part of a name or part of an e-mail address, or a key ID. Most of these commands perform a substring search. Or, even more directly, my full key fingerprint is EC2392F2EDE74488680DA3CF5F2B4756ED873D23, (it's more common but less secure to use the last 16 or 8 characters of a key, so ED873D23 will work too. (Note that the shorter key IDs are just the last 16 or 8 characters of the fingerprint!) Read the technical note on Short Key IDs below for interesting attack ideas using short keys.) The following gpg command will import my key from a keyserver, using my full fingerprint (you can also use the last 8 or 16 hexadecimal digits of the fingerprint as the short or long key IDs.) You may need to prepend 0x to the fingerprint in some versions of GPG, or when using the key ID with the --search-keys option. Read on, though, and see why just importing some key off a keyserver isn't enough to be sure that you're talking with me. You may not have to specify a keyserver in the lines above. Later versions of GPG have a more reliable keyserver list built in. sks-keyservers.net monitors the status of keyservers in real-time. (But it's often down.) If you're having trouble importing signatures from a specific keyserver, or want a list of available keyservers, you might want to look there. I long resisted the temptation to give an overly-simplified "Getting Started" section here because that may falsely lead you to believe that you're being secure. As this document has expanded greatly, it's becoming a better guide. However, the best way to get started with encryption is to go to the home site for GNU Privacy Guard and read the "GNU Privacy Handbook" (available in lots of formats and languages) under the "Guides" section. This will walk you through setting up GPG on your system, including creating your secret keys. This certificate can be used to revoke your key if it is ever lost or compromised. Do not neglect this step! Print it out, save it on a disk, and store it safely. It will be short enough that you can type it back in by hand without much effort if you just print it out. If you have multiple unrevoked public keys and you have messages that say something like "I lost that one, this new key supersedes the other ones," (and I've seen this from people who like to claim crypto experience) then I know instantly that I can't trust you to follow good practice and maintain your secret information, and that I shouldn't trust you with my secrets. So protect your revocation key like you protect your secret keys. Read on to see why the "this key is my new key, ignore the others" excuse is an immediate "red flag" that should make you suspect either cryptographical incompetence or warn you that the person's being impersonated. This section is optional but important. By default, gpg uses weaker encryption algorithms than it could. This is to ensure compatibility with older versions. Now, since you have my public key, are we secure? Well, no, not at all. Lots of people just getting started with cryptography don't realize that they have to somehow verify that this key belongs to me. To me, Alan Eliasen. The one who wrote this message. How do you know that the public key posted above is the one I posted? After all, the bad guys could have replaced it somehow. Listen carefully. This is important. Anyone can generate a public key for any e-mail address. Anyone can post that key to any key server. Only by verifying that the key really belongs to the person you think it does does it give you any security. Without this crucial verification, all that your cryptographic software does is ensures that bits weren't corrupted during transmission, and prevents casual observers from reading the message. It does not mean that you're talking to who you think you are. You could be talking to someone else entirely (a bad guy,) or you could be subject to a man-in-the-middle attack. Update: As proof of the above paragraph, after I posted this document widely, on 2013-07-12, somebody generated a fake public key with my e-mail address and uploaded it to a key server! This is why you need to validate the key directly with the person to make sure you have the right key and the right person! That is, however, an unavoidable problem with public key servers. I thus can't be mad about it, but I can try to educate people to recognize this possibility and do the right thing by validating my public key with me personally! Note that picking a key from multiple options on a keyserver based on which is newest or largest or by comments about "this is my newest key" is dangerous and wrong. Another Update: Forgery of public keys on keyservers is now widespread. On 2016-08-15, many people noted that someone had uploaded fake public keys and signatures for everyone in (an old copy of) the GPG "strong set". These keys even matched the short key ID of the original key, as well as forging all its signatures! It appears that someone finally uploaded the proof-of-concept that the folks at Evil 32 had posted years before. Still, if you want to send me encrypted e-mail, that may prevent other people from reading it. That's good, and sometimes that's all you need. Just understand why I don't have any reason to trust that you're who you say you are, and you don't have any reason to trust that you're really talking to me unless you've verified my key with me. Before I trust you with any secrets, I'll validate your identity. On the other hand, you may not be able to verify someone's fingerprint in person. See the Web of Trust section for more about this. A key could be verified in many ways (such as, I could read you my whole public key, which is really time-consuming and error-prone. It's also bad because the key you see above can get longer and longer as other people sign it.) The usual alternative is to compare the fingerprint of what you think my public key is with the fingerprint of what I know my public key is. Then, you need to verify this fingerprint with me. It's best to do it face-to-face, but if it's someone you know by voice, you can do it on the phone. If you don't know the person, check their driver's license. Ask other people (that you trust) who know them. Even if you don't know them, at least you're verifying that the key belongs to the person you're talking to. Of course, change the e-mail address above to the e-mail address you're confirming. Corollary: If someone puts the fingerprint of their key in their e-mail signature, or in a web page, they really aren't proving their identity. Think about it. If someone's pretending to be you, and forging your e-mail or your web site, they'd certainly replace the fingerprint too. It's not enough to rely on. If you see someone with their key fingerprint in their e-mail signature, it's not a reliable sign that the key with that fingerprint truly belongs to them. If you want to view a person's fingerprint or key ID in Enigmail, you can view that in the "Key Management" dialog, which is the place where you can view and manage public and private keys for everyone in your keyring. If you wish to verify this key, please contact me and I will verify its fingerprint in a public meeting-place. I will be wearing a trenchcoat and a navy blue ascot. You must wear or carry a yellow tulip. Any other flower signifies that contact should be aborted, even if the exchange below is executed correctly. I must not underestimate the necessity of having an adequate stock of proper yellow tulips on hand for this purpose. I will say "The adobe is filled with an excess of straw this season." You must reply "The straw is for the young lambs which roam the heaths near Glasgow in the green, green spring." If I am satisfied with your response, I will reply "The greens at Saint Andrew's are boiled with ham and contain an excess of bitter kale." Do not make eye contact or show signs of recognition. If necessary, I will read the hexadecimal digits of the fingerprint while feigning a book order on my cell phone. Okay, I'm sort of kidding about this section. But you must verify keys with the other person to be truly secure. If you have verified my key, and trust me (and trust your own verification,) be sure to sign it. Now that you've verified my identity, and my public key, you need to tell your cryptographical software that you trust my key. Otherwise, your cryptographical software should do the right thing and warn you that you're communicating with someone that you haven't verified. It's telling you that it has no reason to believe that the key you're using is the one that actually belongs to that person. Below are tips for signing and trusting keys using both GPG and Enigmail. I'm a bit reticent to recommend using Enigmail to sign keys because some of its dialogs are deceptive and wrong. Read the next part very carefully. In Enigmail, you can sign keys by going to the menu item Enigmail | Key Management. Search for the key, and then right-click it. You'll get the option to sign the key. "Please decide how far you trust this user to correctly verify other users' keys (by looking at passports, checking fingerprints from different sources, etc.)" As you can see, that's a totally different question. This is why I encourage you to learn by using GPG on the command-line. It tends to be more rigorous and correct. Also GPG gives you more warnings about selecting dangerous choices like "trust ultimately." Read the next section to find out more. Hint: Type help for the interactive commands. The commands sign and trust are the ones you're looking for. These allow you to both sign a key and indicate how much you trust me to verify other peoples' keys. If you think I'm stupid and lax when verifying and signing other peoples' keys, you'd assign me a low trust rating. In Enigmail, you can also attach any of the public keys in your keyring to an e-mail. As you're composing the email, select Enigmail | Attach Public Key... and select the e-mail addresses to attach. Note that these will not show up in the body of the message, but as a (possibly-encrypted) attachment, possibly using PGP/MIME. For maximum portability, I recommend attaching using the --export method above and including the public key in the body of the message. My reasons are stated in the Attachments section. You can also upload that signature to a keyserver, which makes that signature available to the world. See the Publishing your Public Key section below for how to do this. Hint: If you publicly sign my key without actually verifying it with me, I'm going to assign you a very low trust rating. Sure, you can manually send your public key to people you want to communicate with, but what if someone needs to communicate with you securely and you haven't sent them your public key? The usual way is that you publish your public key to a keyserver so that anyone can import your key. Most of the keyservers in the world mirror each other, so a short time after you have posted your key to one server, it will be propagated to the others. As I have said above, I've had good luck for the past decade with pgp.mit.edu. Encrypt messages that only you can decrypt. Validate that messages were signed by your secret key with a strong guarantee of certainty, and ensure that those messages were not tampered with or corrupted in transmission. These are good things. You want people to have your public key. So below are a few methods of publishing your public key to a keyserver. All achieve the same results. are a necessary part of the message. Don't forget to include them! Again, just because someone seems to have sent you their public key, there's no reason to trust that it's from that person unless you have validated it with them using the instructions in the Procedure for Verification section above. Make sure you verify any keys before trusting them! One way to publish your key to a keyserver is the manual approach from the previous section: export an ASCII-armored key and manually paste it in to a form like the one at pgp.mit.edu. The other way is to let your gpg program upload the key. You can't do this by specifying the e-mail address; you need to specify the public key's hexadecimal ID number. So how do you find this for the key you want to upload? In the above, my public key id is displayed on a line that says pub and contains an 8-character hexadecimal code (ED873D23 in the sample above.) You will need to know this code to upload to the server. You may want/need to insert --keyserver pgp.mit.edu as options to the above if you want a specific keyserver. (These options have to go before commands like --send-keys. Again, most keyservers mirror each other, but it will take time for keys to propagate across all servers. Note that after you've signed someone else's public key, indicating that you've verified their key and identity and vouch that the key is theirs, you can use this same procedure to upload your signed version of their public key to a keyserver, so people can see you've vouched for them. See the Web of Trust section below for more information about this. Again, in Enigmail, everything you do with keys is accessed through the menu item Enigmail | Key Management. Search for the key you want to upload, right-click it, and you have the option to upload it to a keyserver. Couldn't be easier! You still have the same responsibilities to be very careful with signing other people's keys, though. From there, you can just cut-and-paste your message directly into gpg, and it will decrypt it, or import keys, or whatever is appropriate to the message. When you're done pasting, you may need to send your operating system's "end-of-file" character. This is Ctrl-D in most Unixlike systems and Ctrl-Z in Windows-like systems. If the encrypted data is in a file, you can automatically process it by just passing the filename to gpg on the command-line. The gpg executable will generally just do the right thing with it, prompting you for passwords when necessary, saving output files, etc. Warning: When gpg encrypts or decrypts a file, it usually leaves the original file intact!. You must remember to delete the original file yourself, securely if possible. In Linux, you can use shred -u (shred just overwrites by default; the -u is necessary to delete the file afterward) or wipe commands to delete securely. On Windows, sdelete works well. (Although secure deleting isn't guaranteed to work on solid state drives or flash drives due to wear-leveling algorithms. If you're using one of these, and want to securely delete, you have to write over all your free space with a tool like wipe or sdelete) However, don't believe the hype that you need to do dozens of overwrite steps. This is very likely urban legend, or marketing lies. One overwrite is probably plenty. You should be warned that the default action (when passed the name of an encrypted file) is to decrypt the file and leave the encrypted and the decrypted file on your disc! This may be dangerous as it theoretically allows an attacker to mount a "known plaintext" attack. You almost never want to have encrypted and decrypted versions of the same file on your system. You must remember to delete one of the files yourself, securely if possible. See the warning above for more details on how to do this. This never saves a decrypted file anywhere, and lets you easily look at the contents of encrypted files. If you don't have a fancy e-mail plugin that helps you encrypt your messages, it's easy enough to do from the command line. You'll need to save your message to a file. There are several important things in this command. --encrypt tells gpg to encrypt the message using public-key encryption. --sign adds a digital signature that lets you guarantee that the message was generated by you and was not corrupted nor modified in transmission. This is theoretically optional, but see the Signing Messages section below for why this is very important. --armor wraps your output in plaintext "ASCII armor". "ASCII armor" is just a way of turning raw binary data (which will probably get corrupted if you try to send it through most e-mail programs) into a format using only limited ASCII characters, line-wrapped, with appropriate headers, and suitable for e-mailing. This is necessary if you're pasting this into the body of an e-mail, or usenet posting, or forum posting, etc. -r recipient Specifies recipients of the message. You must already have imported the public keys of the recipients. You can specify multiple recipients. If you don't specify recipients on the command-line, gpg will prompt you to enter them interactively. These recipients can also be key IDs. Warning! This is important and interesting! Note that in the example above, your email address is specified as one of the recipients. If you do not explicitly add your own address to the list of recipients, you will not be able to decrypt the message! That is interesting and important and awesome. You may want to write something and send it to someone that you cannot ever possibly be compelled to decrypt! It will be impossible for you to decrypt, even though you wrote it and encrypted it! That is cool. Read the Why Public-Key Encryption is Cool section below for more about why public-key encryption is cool. filename is the filename of the file you're encrypting. This is not strictly required. If you don't specify a filename, GPG will listen for input, and you can type a message directly or cut and paste it in. This is awkward, though. When you're done pasting, you may need to send your operating system's "end-of-file" character. This is Ctrl-D in most Unixlike systems and Ctrl-Z in Windows-like systems. Warning: (I'm repeating this again.) When gpg encrypts or decrypts a file, it usually leaves the original file intact!. You must remember to delete the original file yourself, securely if possible. See the warning above for more details on how to do this. --sign adds a digital signature that lets you guarantee that the message was generated by you and was not corrupted nor modified in transmission. This is theoretically optional, but very important. Think about it: how do you know that someone didn't replace your encrypted file with a different one? By digitally signing the message, you can get a strong guarantee that you're the one who encrypted the message and that it hasn't been tampered with or corrupted. See Signing Messages section below for more on digital signatures. --armor (optional, probably unnecessary) wraps your output in plaintext "ASCII armor". "ASCII armor" is just a way of turning raw binary data (which will probably get corrupted if you try to send it through most e-mail programs) into a format using only limited ASCII characters, line-wrapped, with appropriate headers, and suitable for e-mailing. This is necessary if you're pasting this into the body of an e-mail, or usenet posting, or forum posting, etc. Note that this will increase the size of your message on disk. --output filename (optional) specify the output file. -r recipient Specifies recipients of the message. Can also be written --recipient. You must already have imported the public keys of the recipients. You can specify multiple recipients with multiple -r arguments. If you don't specify recipients on the command-line, gpg will prompt you to enter them interactively. These recipients can also be key IDs. Warning! This is important and interesting! Note that in the example above, your email address is specified as one of the recipients. If you do not explicitly add your own address to the list of recipients, you will not be able to decrypt the file! That is interesting and important and awesome. You may want to create a file for another person that you cannot ever possibly be compelled to decrypt! It will be impossible for you to decrypt, even though you wrote it and encrypted it! That is cool. Read the Why Public-Key Encryption is Cool section below for more about why public-key encryption is cool. What do you do if you want to send an encrypted file attachment in an e-mail? There is a standard called PGP/MIME that try to standardize the handling of encrypted attchments. You cannot be sure that your recipient's e-mail client will be able to handle them, so I strongly recommend never using them. Enigmail doesn't even handle its own attachments that it creates well. Most phone- and tablet-based email software. List servers or remailers that strip attachments. List servers that just don't handle all attachments perfectly. Corporate firewalls that remove attachments. Simple, secure e-mail clients that can only display plaintext. Not-yet-ready-for-attachments e-mail tools like Enigmail itself. I strongly recommend always sending encrypted messages or encrypted attachments as ASCII-armored OpenPGP blocks directly in the body of an e-mail. This will ensure that any e-mail program will still be able to handle them. as outlined in the Encrypting Files section above. Then just paste the results into the body of your e-mail. You can paste in multiple attachments this way, too. Enigmail is buggy and insecure when sending and receiving encrypted attachments or PGP/MIME. I don't recommend it at the moment. In fact, the bugs are so severe that Enigmail's behavior may allow others to obtain your entire secret key. Enigmail fails, for instance, to import a public key or other attachments that it attached itself. You can test this by sending encrypted attachments and public keys to yourself. Enigmail is also insecure in handling PGP/MIME (and possibly S/MIME) attachments because it appears to always automatically and silently decrypt the message for you, even if you have Enigmail configured to not decrypt by default! This is very bad if someone's looking over your shoulder, or detecting emanations from your monitor (e.g TEMPEST) or doing sound-based attacks. You may not even notice that the message was encrypted, and forget to encrypt your reply, or forget to verify the signature, or do something that compromises your security. It turns out that this is a known bug Enigmail Bug #226 which the developers have inexplicably labeled as "Minor." Augh. They are obviously oblivious to the literature. In fact, the creators of the RSA algorithm have explicitly stated in one of the most widely-circulated papers on GPG that this particular bug in Enigmail is what lets them completely steal your private key, using nothing but a microphone near your computer or an electrical connection (e.g. touching your skin or monitoring your computer's electricity usage) while you receive an e-mail! Even if you fix the problem above, Enigmail is still buggy when handling PGP/MIME messages, as it will try to auto-save your messages as you write them, which can pop up a dialog asking you to choose recipients to encrypt to while you're typing, causing you to randomly select recipients as you type. It's just totally broken and annoying. For these reasons, I recommend using the manual procedure above, but here are some tips for using Enigmail if you're lazy and don't care if your attachments get lost or are unreadable by your recipient. 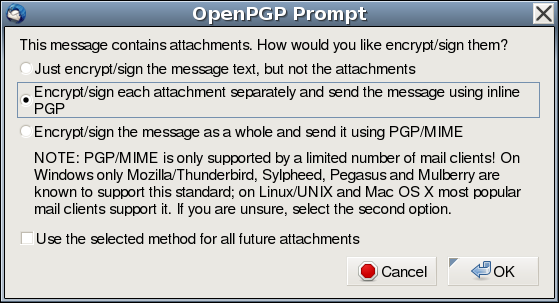 The place to turn off PGP/MIME in Thunderbird/Enigmail has been continually changing, but now it's currently hidden under each e-mail account on the (usually) left-hand side of your screen under OpenPGP Security where the option Use PGP/MIME by default should be unchecked. Here's the current screenshot from the Enigmail project showing where PGP/MIME should be turned off for each account. Choose the option "Encrypt/sign each attachment separately and send the message using inline PGP." However, this doesn't even do the right thing. Its results are unfortunately not identical to the recommended "hand-encrypt and paste" technique described above. It currently still adds multiple attachments, which may get stripped out by mail filters or lost in web-based e-mail clients. Enigmail is then often unable to open these attachments reliably. It certainly can't open public keys that it attaches. Really, just don't use Enigmail for attachments right now. Hand-encrypt them as shown in the previous section. It'll simply work better for more people. In short, all encrypted communications will be accessible to the most people if you always just use ASCII-armored OpenPGP blocks in the body of a plaintext message. It lets you ensure that a message has not been corrupted nor modified in transmission. You should always sign your encrypted messages. Think about it. Everyone potentially has your public key. That's expected. Anyone can encrypt a message to you using your public key, and pretend that it's from someone you know. (It's easy to spoof e-mails, but that's another discussion.) Only if you verify (via the digital signature) that the message was signed by someone whose key you have verified, can you trust the communication. Corollary: You should actively distrust unsigned encrypted communications. If someone's trying to impersonate your friends, they'll just conveniently "forget" to sign their messages. A signed message gives a mathematically very strong certainty that the message was signed by you. In your e-mail client, always choose to sign and encrypt a message. Below are some ways to sign messages manually. The first thing you want to do in Enigmail is to make all of its settings visible. If you haven't done so already, you can do this from the menu items Enigmail | Preferences | Display Expert Settings. The basic settings are inadequate. Start to compose a new e-mail. That is, click the "Write" button. In the "Write" window, choose the top menubar item Enigmail | Default Composition Options | Signing/Encryption Options. Check the Sign encrypted messages by default box. Being very certain that the message is not corrupted in transmission. The --clearsign option will wrap the message in an ASCII-armored signature but will not otherwise modify its contents. This allows even the losers who don't use gpg to read the body of the message, but allows gpg users to verify that you wrote it and that the message wasn't changed. gpg: Good signature from "Alan Eliasen <eliasen@mindspring.com>"
If they haven't verified and signed your public key, then they will be warned that the key is untrusted. This means that all that they can tell for certain is that the message wasn't corrupted in transmission, but it really could have been written by anyone! Beware "Untrusted good signature!" It means that the signature is by someone whose fingerprint you haven't verified. Sometimes you want to sign a file, but without modifying it like the --clearsign option above does, because people would need to edit the file or use gpg to get at the contents. Let's say you found out that a huge company (we'll call them Mapple) wrote a really crappy incompetent insecure website that leaked a lot of their customers' information that anyone could access trivially by adding 1 to a number. Now, you're not sure if the company is awesome and honest and will pay you a handsome bug bounty for pointing out their incompetent security hole and helping them protect their customers' information, or if they are psychotic morons who will claim post-facto that your access of information they intentionally published on a public webserver without any access control was "unauthorized" and have you charged under the insanely incompetently-written and outdated Computer Fraud and Abuse Act (CFAA). You can prove that all subsequent messages signed with the same key are from the same person, even if you jump to different e-mail addresses or communication channels. If they decide to be honest and offer you a bounty for your services to them and their customers, you can prove in the future that you're the person in possession of the corresponding secret key that signed the messages, for example, by decrypting something sent to you encrypted with your public key. Nobody else would be able to falsely claim that they're the submitter without verifying that they have the corresponding secret key. Keys get compromised or lost and they are revoked. Keys are signed by more people, building a Web of Trust. Note that other people can sign your public key and upload the signed key to a public webserver! So you might even find that your own key has been updated! Enigmail can update all of the keys in your keyring from a public key server. The way to trigger this is from the menu items: Enigmail | Key Management | Keyserver | Refresh all Public Keys. Again, I might suggest that pgp.mit.edu has been a reliable keyserver for me. If you enter part of the name or e-mail address or key ID as the last argument on the command-line, then only keys that match that pattern will be listed. In Enigmail, you can see the signatures for a key by going to Enigmail | Key Management, searching for a key, right-clicking on that key, and then choosing View Signatures. Or you can browse your key on a public keyserver, like pgp.mit.edu. This is advantageous because if you haven't imported someone's key yet, they will just show up as a key ID number. Again, if someone signed your key without validating the fingerprint with you, they are actively damaging the web of trust. You should import their public key just so you can tell your software to actively distrust it as outlined in the Signing a Key section. In the examples above, I stress the importance of verifying people's public keys with them. But sometimes you can't do that directly. So how can you verify someone else's public key? Let's say I want to talk to Bob. I've downloaded a public key with his name from a keyserver, but I can't be sure that key belongs to him. I could maybe call him on the phone and verify his key that way, but I don't know his voice, and I don't have his phone number. Or maybe he's even under duress. Luckily, my friend Alice has signed his public key. I trust Alice to have verified his key properly. I have validated and trusted Alice's public key personally. Thus I have a good reason to believe that Bob's key really belongs to him. This is why it's important to validate other people's keys very carefully and to build a web of trust--so you can communicate with people whose keys you can't personally verify. See the Signing a Key section above to see how to sign someone else's key and upload it to a keyserver. Conversely, you may not want to publicly sign the keys of people you communicate with. You may not want others to know who you communicate with. You may have more than one keypair, and use them selectively for communications with a single person once they've demonstrated strong cryptographic practices. This is serious business. An example from Syria shows how people die when others don't protect their communications. If you don't want anyone to be able to analyze who you're talking to, even by traffic analysis of key IDs, you can specify hidden recipients in your messages. By using encryption improperly, you can make your encrypted communications easier to break. Some of the tips here are speculative and may not apply to all cryptographic algorithms, but many cryptographic algorithms are subject to common types of attacks. These tips will help mitigate those potential weaknesses if algorithms are found to be vulnerable to these types of attacks. TODO: Improve ALL THE THINGS. Send me more examples of good and bad cryptographic practice, and ciphers that have been broken by poor cryptographic practice. You think this is academic and known-plaintext attacks can't happen? Well, take a look at this recent break on the widely-used RC4 cipher. (It's used in SSL/TLS and in WEP/WPA in wi-fi.) It was found that if you knew a small amount of plaintext, you could recover the rest of the message (given a fairly large amount of encrypted communications, to be sure.) With as little as 6 bytes of plaintext, and a large number of communications, the rest of the message could be decrypted with high probability. (The more bytes are known, the easier it is to break.) Also, keep in mind that breaks in cryptographic algorithms only break them further. Don't be polite. As a corollary of the above, don't start and end your message with predictable phrases or pleasantries. Don't send HTML-formatted encrypted emails. There's a large amount of predictable boilerplate in HTML. No signatures! As a corollary of the above, when sending encrypted messages, don't include your usual .sig file with your name, e-mail address, phone number, password, website, company policy, etc. This doesn't mean "no cryptographic signatures!" You still want cryptographically strong signatures like the kind you get with --sign. Smart e-mail add-ons like Thunderbird with Enigmail can suppress your signature when using encryption. Or you should encrypt just the meat of your email (and not the signature) if you need that silly signature. Don't quote previously-encrypted text. When replying to an encrypted message, don't quote the original text. Again, having large stretches of expected text has been the downfall of many cryptographic algorithms. Don't have encrypted and unencrypted versions of the same information. As noted above, gpg does not automatically delete the plaintext version of a file when you encrypt it! Read that section on securely deleting files if possible. Garbage is good. One of the hard problems in cryptography is identifying when a message has been successfully decrypted. How do you know? When it all comes out as mostly alphanumeric characters? When its word frequency looks like English? Make it hard for the bad guys. Jam in a bunch of random bytes into your message if you can. It'll make it harder to even detect the fact that the message was decrypted properly. Send your friends encrypted random bytes every day just for fun because screw the surveillance state we live in! If everyone did this, it would be utterly prohibitive to try and decrypt all of the random data flying around. If it's received encrypted, store it encrypted. Some e-mailer plugins will offer to decrypt messages and store the decrypted versions in your mail folder. Don't do this. It allows someone to mount a chosen-plaintext attack on you just by sending you an encrypted message. Yes, it will make your messages impossible to search for content. But that's good. Don't encrypt stuff from untrusted sources. There is a class of attacks called a "chosen-plaintext" attack. Some encryption algorithms can be weakened or completely defeated if the attacker is allowed to choose the text that you are going to encrypt with your key. Always refuse to encrypt something specific that a third party asks you to encrypt, especially if it's lengthy. Hide your encryption entirely! There's a branch of cryptography called "steganography" which hides secret communications in innocuous places that are very hard to detect. For example, by slightly modifying the least-significant-bits in the pixels of a JPEG image, you can hide encrypted messages in pictures of kittens! Or, you can hide them by adding slight, undetectable noise to audio files. It becomes very difficult and expensive to determine that a particular image even contains steganographic content. That's the best way to hide your information, especially as the NSA has decided that using cryptography to protect your privacy is probable cause that you're a terrorist, and they allow themselves to keep encrypted content "for as long as necessary" to break it. gpg will then prompt you for a password. If you want to paste the encrypted file into an e-mail or something, you can use the --armor option. If you want to force the encryption algorithm used (the default is maybe CAST5), you can add the --cipher-algo name command-line option, for example --cipher-algo AES256 . The list of available encryption algorithms in your version of gpg can be found by running the gpg --version command. If you use symmetric encryption, you also need to solve the age-old problem "how do I communicate the password securely?" Read on for the solution to that problem. In short, public-key encryption solves the age-old problem "how do I communicate a password securely?" You no longer have to. You just need the other person's public key, which can be published to the world. You can also encrypt a message that you can not decrypt! This may sound silly, but you may want to write something to someone that you cannot ever possibly be compelled to decrypt! It will be impossible for you to decrypt, even though you wrote it and encrypted it and even if you have the file in your possession and even if you have all your secret keys and you know all of your own passwords and have them written down! That is cool. (You can smile serenely while they're beating you with a rubber hose, knowing that you can't endanger the lives of your sources, nor give up your rights, even if you felt like that might be entertaining for a change.) You can see how to do this physically in the Encrypting Messages You Can't Decrypt section. If you're a reporter (or other human) traveling abroad, you can encrypt materials using public-key encryption, to someone else's key, but without encrypting to your own public key. (Warning: some tools will encrypt to yourself by default. Read on.) It's easy to create a message that you can never possibly decrypt yourself, and cannot possibly be compelled to do so! Ever! You could encrypt them, say, using only the public key belonging to your newspaper's editor or lawyer. (And if your newspaper's editor and lawyer don't have public keys, have them contact me and I will help them. They need to do this. Now. Before they kill people.) You can be detained and couldn't ever be compelled to give up the password, as you never had it! You don't have to be in Syria (although journalists who don't use encryption kill people; read the link) or North Korea for this type of Orwellian police state coercion to happen. Even the otherwise-civilized United Kingdom has vile horrendous laws that can jail you without trial if you don't give up passwords. Edward Snowden has also stated that he has in his possession encrypted documents that he cannot possibly be compelled to decrypt, even under torture. (But maybe other trusted people potentially can decrypt them.) Public-key encryption is probably what he was hinting at. Nice work. Also see the Hidden Recipients section of this document to see how to hide the people to whom you've encrypted. That may be very important for journalists or dissidents or ordinary people who want to assert their rights to free association. It also allows you to post encrypted messages to public forums without anyone knowing who you're talking to. Also see my Steganography tools which let you hide the fact that any hidden communications are happening at all! You can hide secret communications in pictures of kitties. Let's say you have a web server that collects very sensitive user information. You don't trust the security of the web server, but you have to keep the information on that web server for a while before you move it elsewhere. Say, to a computer completely disconnected from the outside world. With public key encryption, you can encrypt information with a public key stored on the web server. However, the secret key would not ever be kept on that server! Even if someone breaks your web server wide open and has total access to every single file, and every single algorithm, and the public key, they will still never, ever be able to decrypt the private information on the server because the secret key needed to decrypt it is not on the server at all! Miracles! If you rent space in a server farm, this can prevent malicious administrators at the hosting company (who probably hold superuser access on your machine, and can read all your files) from being able to do anything with your data. And it keeps your web server administrator or database administrator from seeing that sensitive data, even if they have complete access to every file on the computer. A real-world example of storing sensitive communications: The Federal Communication Commission's (FCC's) Lifeline subsidized cell-phone program for low-income people leaked highly sensitive customer information for over 170,000 people, including Social Security numbers, birth dates, home addresses, and sensitive details about family finances from a public web server. Think about how you could use public-key encryption to collect and encrypt this data securely on the webserver, and only be able to decrypt it somewhere else much safer. Again, see how to do this in the Encrypting Messages You Can't Decrypt section. It's easy to revoke access to one member of a group. If everyone in a group shared a password, it would be very difficult to remove one person's access. A different password might have to be created, and that password would have to be communicated securely to all other members of a group. Public-key encryption means that you can control exactly who is allowed to read future communications. If you don't want someone to read it, just stop encrypting to that person's public key. Even if they can still see your encrypted communications (like on a public mailing list,) they will no longer be able to decrypt it. Here are a collection of fun tips and tricks and puzzles for using GPG. Please send me more. By default, gpg uses weaker encryption algorithms than it could (especially if you generated your keys using an older version of the software.) This is to ensure compatibility with older versions. Part of your public key specifies your preferences for the encryption algorithms that you want people to use when communicating with you. These are, by default, somewhat weak. You can view and modify these preferences to make your communications stronger. This will display a list of matching public keys. You may need to enter the number of your key in that list so you can edit it. Hint: You can always type help at the gpg> prompt to see all available commands. There's lots of fun stuff hidden in here. You may want to add other algorithms that your software supports, or you may want to disallow algorithms that you think are too weak. Note: You should then re-upload your key to a public key server and send it to the people you communicate with. Until people have imported your new key, they will still be using the old algorithms when encrypting to your public key! "When setting preferences, you should list the algorithms in the order which you'd like to see them used by someone else when encrypting a message to your key. If you don't include 3DES, it will be automatically added at the end. Note that there are many factors that go into choosing an algorithm (for example, your key may not be the only recipient), and so the remote OpenPGP application being used to send to you may or may not follow your exact chosen order for a given message. It will, however, only choose an algorithm that is present on the preference list of every recipient key." Warning: This means that if you're encrypting to several people at the same time, GPG will only use the strongest algorithm that the weakest person uses! Beware when encrypting to multiple recipients; one person can (accidentally or intentionally) weaken the encryption algorithms used by the whole group! Corollary: Don't be the weakest link in your group! If you are still using weak encryption preferences, you are bringing down the security of the entire group you're communicating with. You are not weakening the security of your own communications, but those of everyone you communicate with! Corollary: Inform the weakest links in your group that they could be using stronger ciphers. Point them to this section (Stronger Algorithms) of the documentation and help them fix it. Get their updated public key and help them test their preferences using showpref as described above. Corollary: Update your keys often, so if someone on your keyring chooses to use stronger algorithms, you respect their preferences. Corollary: If you update the keys of people you're sending group messages to, make sure they (or someone else) hasn't (intentionally or accidentally) weakened their algorithm choices. Yes, this is painful and hard, but it's one way that an attacker might infiltrate your group and degrade your cryptographic algorithms. TODO: Write some script that determines who is the weakest link in a group? Public-key decryption: GPG uses your secret encryption key to decrypt a session-only secret key that was encrypted with your public (RSA or DSA) key. Symmetric decryption: GPG uses this session-only secret key to decrypt the "body" of the message which was encrypted using a symmetric algorithm like AES or AES-256. Your public key (RSA or DSA) is only used for the first step. The actual body of the message is encrypted with a (faster) symmetric encryption algorithm, so it's important to make sure that you're using strong algorithms for both phases. gpg --list-packets can list the packets of any GPG file and give details on what's contained therein. This tends to output not-very-meaningful numeric data about which encryption algorithms were used, but you can decode these by looking at the specification for the Open PGP standard, RFC 4880, specifically Section 9. You can also use programs like pgpdump to see what's included in a PGP message. Also see the Automating GPG section below to see more options for dumping detailed information about what GPG is doing. You can encrypt documents that require several people must cooperate to decrypt, by encrypting with multiple passes, specifying a different recipient each time. They will need to decrypt in the reverse order that you encrypted. TODO: Make an example, preferably one that writes no intermediate files (e.g. output to stdout using --output -) and doesn't make you enter passwords multiple times. Naïve versions make gpg complain with weird "broken pipe" errors and races in password entry. The --throw-keyids command-line option is essentially the same as using --hidden-recipient for all recipients. There are other interesting options for hiding recipients in the GPG key-related options documentation. The section Why Public-Key Encryption is Cool explains reasons that you might want to create an encrypted message that you can never be compelled to decrypt. This section discusses how that is performed. When you encrypt a message in GPG from the command-line, it does not encrypt to you by default! You would need to specify your own e-mail address as a recipient with the -r recipient@email.com option for you to be able to decrypt it. Global solution: You can turn off encrypting to yourself by default from the main Thunderbird menu: Enigmail | Preferences | Sending and uncheck Add my own key to the recipients list. Warning: This means that you won't be able to decrypt any e-mails you send to anyone after this, until you re-enable this setting! This is a global, persistent setting, not a per-message setting! Turn off signing to yourself using the "Global Solution" above. Make Enigmail prompt you for recipients to encrypt to every time you send a message. To enable this, from the main Thunderbird window, select: Enigmail | Preferences | Key Selection | Manually. Then, every time you send an encrypted e-mail, it will pop up a dialog which allows you to select which identities on your keyring that you are going to encrypt to. If you do want to encrypt to yourself (so you can decrypt and read that message later,) you'll have to manually select your own identity in the list. This is annoying. Note that if you don't perform step 1.) above, Enigmail will still encrypt to you even if your name is unchecked in the list!. Seems like a bug. Creating a new public/secret keypair key for yourself which you will then communicate to others. Updating when someone else generates a new public key. These are addressed in the sections below. Know your old and new key IDs. Throughout most of this document, you use e-mail addresses to identify keys. However, once you have more than one key for a given e-mail address, things get a bit trickier. GPG behaves somewhat dangerously and uses the first secret key in your keyring, unless you explicitly tell it otherwise. Thus, you will need to know the key IDs of your old and new keys, and use them in the right places below. I have highlighted the key IDs in bold. They appear on a line beginning with sec. As you can see by the creation dates, the old key ID is B05676B1 and the new key ID is ED873D23. Yours will be different, of course. Make a note of them. Create a revocation certificate for the new key. This will let you revoke the key if you lose it. See the directions in the Generating a Revocation Key section of the documentation, but substitute your new key ID for the e-mail address. You may also want to change the filename if you already have a revocation key for your old key. Sign the new key with your old key. If people have your old key, this helps them trust that the new key was generated by you. ENIGMAIL WARNING: Even if you have set this default key, and disabled your old key, Enigmail will still use the old, disabled key to sign your messages! It ignores gpg's default-key setting and does something very dangerous and wrong to choose the signer! In fact, Enigmail probably ignores all your settings in your gpg.conf file and does its own broken, random thing. To work around this, you apparently need to tell Enigmail what your new key is explicitly. This setting is hard to find. The place to configure this is currently hidden under each e-mail account on the (usually) left-hand side of your screen under OpenPGP Security where the option Use specific OpenPGP key ID should be checked, and your new key ID entered in the box. Here's the current screenshot from the Enigmail project showing where this setting should be configured for each account. This e-mail thread from an Enigmail/Mozilla engineer corroborates some of this scary, dangerous awfulness. And then using the command disable followed by save. (Which in some versions is apparently just quit). You can theoretically re-enable it in the future using enable. Because of the glaring problems and outright bugs in Enigmail and GPG's handling of multiple keys for the same e-mail address, it's not a bad idea to delete the old key when you can finally be free of it. I have a sample migration document that you are free to use and modify. (Optional) Upload the new key to a keyserver. See the Publishing your Public Key section for how to do this. This step is important if people have signed your key and sent it back directly to you, as their signatures will not appear on public keyservers until someone uploads to a keyserver. "A revoked public key can still be used to verify signatures made by you in the past, but it cannot be used to encrypt future messages to you. It also does not affect your ability to decrypt messages sent to you in the past if you still do have access to the private key." Since you have no guarantee that people do that (and few people do it regularly, in my experience,) then you need to make sure that you communicate the revocation to people you have communicated with in the past. Again, see the "Communicate the new key..." section above for a sample document explaining how to do this. You may also fetch the new key from a keyserver. Be sure to read on and validate that the person actually uploaded it! Know their old and new key IDs. Once you have multiple keys for a person, GPG behaves very badly. It uses the key for the first e-mail address that matches, and ignores the others! I have highlighted the key IDs in bold. They appear on a line beginning with pub. As you can see by the creation dates, the old key ID is B05676B1 and the new key ID is ED873D23. Yours will be different, of course. Make a note of them. You will need them in the following steps. Validate the new key with the person. You should always be warned that anyone can generate a public key for any e-mail address. Anyone can post that key to any key server, so you need to follow the instructions in the Procedure for Verification section of the document to validate that key with the person! In Enigmail, you can get to this from Enigmail | Key Management, searching for a key, right-clicking on that key, and then choosing View Signatures. You are looking for "Yes" in the "Valid" column. And then the sign command, followed by save. (Which in some versions is apparently just quit). (Optional) Send the signed key to its owner. Again, see the Signing a Key section above to see how to sign someone else's key and export it for e-mailing, or to send it to a keyserver. Delete or disable the old key. Since you now have both keys on your keyring and you no longer want to accidentally use the old key, you should delete or disable the old key. With all the problems with GPG and Enigmail's handling of multiple keys for the same e-mail address, deleting it is by far the safest option, but simply disabling it means that it should no longer be used for encryption (although the bugs listed above for Enigmail leave me with little confidence in its ability to choose the right key.) However, GPG may still trust signatures made by a disabled key, so if the other person's old key was stolen (and not revoked) then you might be at risk of accidentally trusting it! Check that you have the correct key, and then type either disable or delete. After that, type save and save your changes. From Enigmail: From within Enigmail, you can disable or delete a key by the following: Enigmail | Key Management. Search for the key you want to modify, right-click it, and you have the option to delete or disable it. Here's a fancier one I printed out 4 to a page for a keysigning party at DEFCON: DEFCON fingerprint document. Bring a pen, some paper, and a photo ID. You may wish to obscure sensitive details on your photo ID (e.g. license number, address, birthdate) if you're not meeting with people you know and trust. Blue painter's tape works well for this. If your key is on a public keyserver, then there is no step 3! You're ready! If your public key isn't listed on a keyserver, then either publish it to one or, (less friendly,) provide a way for others to download it. (Say, by publishing a URL on the paper that contains your fingerprint.) I definitely don't recommend exchanging flash drives at a keysigning party! Once the identity is validated, sign or initial the fingerprint you received from them, and keep it in a secure place. You will need it later. (Optional) Go around the room in a group with people you know. If you personally know someone that you're exchanging keys with, let your friends know that, and ask them to do the same. Introduce each other. It enhances the trust level. (Optional) Ask the person if they have a photo of themself in their public key. (You can attach a small photo to your public key, which makes it harder to impersonate you in person.) If they do, you might ask to take a picture of them to compare with the picture in the public key later. You can also search for keys by e-mail address instead of key ID, using gpg --search-keys their@email.address but if you don't even have the e-mail address, the fingerprint alone is sufficient. Again, you could also search by e-mail address instead of key ID. See the Fingerprint section of this document to see how to verify fingerprints in Enigmail. Verify that this fingerprint matches the one you have on paper. You just do this with your eyes, comparing the 40-hexadecimal-digit numbers. Sign the key if everything matches. See the Signing a Key section for detailed information on how to do this. You may sign the key publicly or locally. Signing the key tells your cryptographic software that you've validated the other person's identity and that your software no longer has to warn you that the key has not been properly verified and trusted. and then using the commands sign (which will show you the fingerprint, you can also generate it with fpr and trust followed by save or quit. Hint: Type help for the interactive commands. If you've publicly signed the key, return the signed key to its owner. This allows them to import your signature and share that signature with others. Again, see the Signing a Key section of this document for ways to do this. and then emailing that output to the owner of the key. When you receive your own signed key from others, import it. See the detailed steps in the Importing a Key section of the documentation above. Periodically publish your newly-signed key to a keyserver. As you get new signatures, publish them to a keyserver. See the detailed steps in the Publishing your Public Key section of the documentation above. Most people won't see the new signatures until they're published to a keyserver! Periodically refresh keys from a keyserver. See the detailed steps in the Updating Keys section of the documentation above to collect all the new signatures from the keysigning party. You may find that other people have signed your key and uploaded them directly to the keyserver. This also helps you collect the web of signatures from all the people who were at the keysiging party. If you see signatures that have [User ID not found] you might have better luck examining your key at pgp.mit.edu or sks-keyservers.net. I'm often asked: "somebody sent me a GPG message (or private key) and GPG can't import it (or says it's empty.) What is wrong?" Make sure the BEGIN and END lines are on a line by themselves. Make sure the BEGIN and END lines begin and end with exactly 5 hyphens. Make sure that those 5 hyphens are really hyphens (ASCII decimal code 45, hexadecimal 0x2D). Make sure there is a blank line after the BEGIN line and before the base-64 encoded cryptographic material. This is required! Anything before the first blank line is treated as directives to GPG, such as comments or character sets to be used in the decryption. Note the required blank line before the base-64-encoded material in both cases! This error happens commonly when people use web publishing platforms and cut and paste their key in. The publishing platform (or the misguided human editor) often loses this crucial blank line. When publishing gpg-encoded material in HTML, it's safest to wrap it in a <PRE> ... </PRE> block and don't let your editor touch it in any way. The last line that looks something like =7DhM should be on a line by itself. The line before it is allowed to end with zero, one or two equals signs as per the normal base-64 encoding algorithm. Some editors or linewrapping algorithms smash these together and make them ambiguous. Make sure lines are wrapped reasonably. By default, gpg wraps ASCII-armored lines to 64 characters. While it can handle other lengths, email programs will sometimes append lines to each other and can join or break lines (especially headers with hyphens) that are intended to be separate single lines. Mobile-phone-based e-mail clients with narrow screens are some of the worst culprits for badly wrapping lines. To fix any of these problems, you may need to save the ASCII-armored message you received and fix it up by hand in your favorite text editor, and then pass that file to gpg, either using the importing a key method (for public keys) or manually decrypting method for encrypted material. If someone is sending you broken ASCII-armored material, please point them to this section of this page and help them fix the problem, and communicate more reliably with others. If you are sending or receiving encrypted material in an HTML-formatted email, or a multipart/alternative email, then that is almost certainly the problem! Fix this first. Solution: Always email all encrypted content as simple ASCII text. Not HTML, not multipart/alternative. Only plain text. Go fix your emailer's settings now. I have not yet seen an encrypted email message sent in HTML or in (HTML and plaintext) that is not problematic or outright broken. Rule of thumb: If the people writing your email/encryption software don't go to great lengths to prevent you from sending HTML-formatted emails, they really can't be trusted to do the right thing. And then the body can contain sections of different MIME types, like one for plain text, and one for HTML. The incredibly dangerous and stupid part about this is that the sections can contain utterly different things. The plain text section can say "You have WON the lottery" and the HTML section can say "You have LOST the lottery". The HTML section is wrapped differently from the text/plain section. A signature will not validate if the lines are wrapped differently than it was originally written. This is incredibly common. Lines are wrapped in one version, not wrapped in another. Lines are broken up with <P> tags in the HTML which causes blank lines to appear between lines or paragraphs when you try to paste into gpg. Which then (correctly) fails to decrypt. The spammer can use HTML to make a link show one place, and go to a completely different place. It's even worse if your mailer encrypts a document that it has already formatted in HTML. HTML has lots of repetitive and predictable "boilerplate" that facilitates "known-plaintext" attacks. Read the Good Encryption Practices section of this document to see why that's dangerous. As a wise guru once said, "there are two types of emails: plain text and wrong." This is especially true for encrypted content. Before you start sending encrypted e-mails, or public keys, to other people, send them to yourself! And try to decrypt or import them yourself! If they don't work for you, they will certainly not work for anyone else! Send your public key to yourself. (See the Manual Exporting section of this document.) You can (and should) try to re-import your own public key. Re-importing your own public key multiple times will not harm anything. In fact, you should practice doing this, because someone may send you your own private key with their signature added to it. If you cannot re-import your own public key, then something is wrong with your process. Send an email to yourself and try to decrypt it. If you can't, nobody else will be able to either! If you publish your public key on a webpage, try to import it back to yourself! I can not stress this enough to journalists who publish broken keys on their websites. Usually they can fix this with these troubleshooting hints. The rest of this document contains advanced technical notes. Please send me more. With (at the time of this writing) over 3 million keys in public keyservers, (obtained from the sks-keyservers status pages) there are likely many collisions. One would first expect to see a collision with only about 82,000 keys in the keyserver. The mathematics of finding the probability of collisions can be found in the Wikipedia Birthday Attack article. There's more information in the interesting article Short Key IDs are bad news (with OpenPGP and GNU Privacy Guard) which demonstrates real instances of key ID collisions. Warning: In fact, as a proof of concept, the folks at Evil 32 have generated a full copy of the GPG "strong set" with faked 8-character key IDs and faked signatures, which have been now uploaded to the public keyservers (presumably by someone else.) You will find collisions with short key IDs, and finding longer collisions is possible with tools like scallion. Summary: Use the entire fingerprint to communicate your key ID, or to fetch it from keyservers. The 8- or 16-digit keys are simply the last 8 or 16 hexadecimal digits of the fingerprint. Read on to find out how to find that ID. You can change this to get long or short keys using the --keyid-format short|0xshort|long|0xlong option. However, read on to see a more common way to find the 16-hex-character key ID using only the fingerprint. You might not have noticed that your key ID is the final digits of the fingerprint of your key. It took me a long time to realize that. A fingerprint is usually the SHA-1 hash of a key, which is 160 bits, or 20 bytes, or 40 hexadecimal characters. Your short key ID is the last 8 hexadecimal digits of your fingerprint. Your long key ID is the last 16 hexadecimal digits of your fingerprint. So you can always find the long or short key ID if you have someone's full fingerprint, but you can and should always use the full fingerprint to import from a keyserver. You should always use the full fingerprint to receive keys from a keyserver, or to communicate your key ID with others. (You may now have to prepend 0x to the fingerprint for commands like --search-keys to work correctly.) For example, to receive my key from a keyserver, you should use my full fingerprint something like this. This section describes workarounds for Fedora Linux (and perhaps other Gnome and Mate environments) where Enigmail apparently remembers passwords forever, even if you don't want it to. I noticed that Enigmail never expired my gpg passphrase, even when I told it to expire after 2 minutes of idle time. Even worse, it would then automatically and silently decrypt PGP/MIME messages when I tried to view them, even though I told Enigmail to not automatically decrypt. That's dangerous. If an attacker adds lot of attachments, they can mount known-cryptext attacks and recover your entire signing key, even with an acoustic attack that never touches your computer! Update: This is apparently a known bug, Enigmail Bug #287. However, that didn't work. I tried switching off "use gpg-agent for passphrases" in the Enigmail advanced preferences, but that didn't work either. Enigmail then wouldn't talk to gpg-agent usefully so I cut it out of the loop also. I disabled "use gpg-agent for passphrases" in the Enigmail advanced preferences. After that, Enigmail popped up its own gpg key dialog, and everything worked just fine, with Enigmail forgetting the passphrase after the specified time. Note that this may not work just fine if you're using gpg2, which may require the use of gpg-agent, so you may have to work harder to set that agent up correctly. Please let me know if you have better workarounds. If you're automating things, you can specify the password for encryption and decryption with the --passphrase password command-line option. Note that the password may get stored in your command history, will be visible in a process list, etc., so this is generally a Bad Idea. You can mitigate this somewhat with the --passphrase-file filename option. Just protect that file! Note: In gpg2 and possibly some versions of gpg, you will have to specify the --batch option for gpg2 to actually use those passwords or passphrases! It doesn't hurt to specify it in these cases. The --batch option also prevents gpg from popping up a password entry field or anything requiring human interaction. Signing a key with --sign-key still prompts you if you really want to sign, even with --batch and a passphrase, but you can add the --yes option to automatically choose "yes" to the prompts. The gpg program usually sends a lot of status information to standard error (stderr) but you might want that output directed elsewhere, or sent to a file. The --logger-file filename or --logger-fd filedescriptor will redirect that output. For more machine-parseable output, there's a status file that can be written using the --status-file filename or --status-fd filedescriptor options. This gives lines that indicate details of what was found in the message, what was tried, and the detailed status of each step. More details about this output can be found in the Unattended Usage section of the GPG documentation. For more fun, here are some Esoteric GPG Options that you may need to know to automate GPG. Read on to the next section to see how to specify where gpg stores its configuration files and keys. Alternately, you can pass the --homedir dir option to gpg on the command-line with each command. First, read the Using Stronger Algorithms section above to see how to configure gpg to prefer that people use certain algorithms when sending to you. That section is probably more important than this one. It's far more important that you and the person you're talking to use the recommendations in the Using Stronger Algorithms section above. You really need to know what you're doing to use these, though. See the GPG Protocol-Specific Options page for more. Expert tip: If you really want to force the algorithm used, you can use the --cipher-algo name command-line switch for symmetric or public-key encryption. The --personal-cipher-preferences options above should be used if you don't want to accidentally violate the OpenPGP specification. You can use the --cipher-algo name argument if you know that your recipient has a modern version of GPG but doesn't have their public key set up well. Again, encourage them to improve their public key using the Using Stronger Algorithms section above. Warning: This section is somewhat speculative and may not help you really improve your security against a sophisticated attacker, but may help defeat some threat models. Your secret keys are, by default, encrypted with older encryption algorithms (CAST5) and hashing algorithms (SHA-1, iterated over 65,536 rounds). You can modify these preferences, though. and then changing the password using the passwd command, saving/quitting using save and saving the changes. This forces your secret key to be encrypted with the AES-256 algorithm, SHA-512 hashing, and the mode is iterated and salted. The count means that the hash will be applied 65 million times (which is about the maximum allowed.) This will greatly slow down the decryption of your secret key (it takes about a second on my computer, but that's rarely a problem,) which might significantly slow down attackers attempting to brute-force your password. Reduce the count if you need to decrypt many messages very quickly, as you will encounter a noticeable delay every time you decrypt a message! The more expensive that you make attacks on your secret keys, the better. This may not protect you against the highest-level attackers, nor will it prevent attacks directly against the symmetrically-encrypted parts of your message (see the Using Stronger Algorithms section above to improve this,) but it will certainly discourage someone who has obtained your secret keyring and is trying to brute-force the password (say, by using the password-generating features of John the Ripper and passing them into the GPG executable.) This will slow down the speed of password cracking by many orders of magnitude, which is often enough to make brute-force attacks greatly infeasible. More information at Christopher Wellons's excellent blog entry. In the OpenPGP standard, the number of iterations is actually coerced into a single byte, so not all numbers of iterations are possible. Here's more information about the equation and valid values for --s2k-count. There is some dispute if these particular options are the best, so do your research. For example, AES algorithms are designed to be fast, so a slower algorithm might actually be better if you're trying to slow down attackers. It is also possible that this could weaken your security if the hashing algorithm has fixed points or cycles, that is, values where the input to the hashing function equals the output from the hashing function. Extending the number of iterations may make it more likely that a fixed point or cycle is struck. (Read Donald Knuth's amusing anecdote about fixed points in his homemade random number generator in Volume 2 of The Art of Computer Programming about how easy it can be to strike fixed points. (Legal links, anyone?)) More research is warranted. Update: I did more research in the technical note below. Since the argument of the exponent is often a very small number, due to the number of states being very high, (2128 for MD5, 2160 for SHA-1, 2512 for SHA-512,) we will have to use an arbitrary-precision exponential function and extended precision in many environments. Below is a Frink program (a programming language that I wrote) that calculates the probabilities. Thus, the probability of seeing a random hash cycle with the SHA-512 procedure above are so low (given our assumptions!) that we can estimate that it won't happen in the lifetime of anyone on the planet living today, and we can proably safely assume that using many iterations, as noted above, will probably improve our security. QED. Note: I'm also running homemade programs that are attempting to find cycles in iterated MD5 hashes. It builds a giant hash table of the last 100 million hashes it has seen, and will detect any cycle shorter than this. It's not likely I'll find one if the hashing function is designed well. If, for some reason, you want to back up your secret key and possibly print it, you can use the --export-secret-key --armor option to gpg, possibly using the --output filename option to output to a specified file. Then you could, say, engrave that onto a piece of metal and store it away in a cave for 1000 years. Or whatever. It will be ponderous and error-prone to type that key back in, especially with a large key or a key that contains a photo. Note that one advantage to using the --export-secret-key and --export options to back up your keys is that you can merge these into another keyring with the --import command, and the permissions will be set up correctly for you. If you want to change where these keys are stored, experiment with multiple keyrings or create a "sandbox," see the Making a Sandbox section of this document. Warning: Read this whole section before making any decision. This section is actually a warning against these practices, rather than a recommendation. Alex Cabal has a document entitled "Creating the perfect GPG keypair" (Link opens in new window) in which he describes creating subkeys of your keypair that you can use on a device like your laptop, which somewhat mitigates the risk of your laptop being stolen. In short, it allows you to create a new subkey that is used only for signing, which you keep on that laptop. If the laptop is stolen, you can revoke that signing key which is claimed to prevent the thief from impersonating you. However, I think that this practice is very dangerous, if not outright wrong. There are good tips about managing secret keys in this document, but I argue against its primary premise. You should be most strongly warned that these practices will leave your communications wide open for interception. The document linked above does not warn you in the strongest possible terms that the practice of creating the "perfect key" lets whoever stole your laptop decrypt and forever continue to decrypt all your email (if they can guess the password used to encrypt your secret key) yet you go on blithely pretending they can't! That is very poor practice. All that the subkey business does is prevent the attacker from impersonating you by signing messages. (But, again, only if they can guess the password used to encrypt your secret key, and only if your recipients know that you've revoked the key.) If they can guess your password, the attacker could still read all your encrypted messages forever. Read on. to find out that keys have been revoked, they may never even know that you revoked the signing key, and they will continue to trust your signature. If the person who stole your laptop (and thus your secret keys) could ever impersonate you (because they guessed the password for your secret key), then they can forever decrypt all the communications sent to you with that same key if you follow the "perfect keypair" advice. Allowing your attacker to read your encrypted communications forever, and pretending it didn't happen, is extremely bad and wrong cryptographic practice, obviously. If your decryption key is stolen, revoke that entire keypair and never use any part of it again! Otherwise, your attacker can forever read messages encrypted to your public key. It appears that the primary benefit of following this procedure is not having to rebuild your web of trust with a new key. However, how much trust should you give to someone who still uses a key that has been knowingly compromised and does not properly protect your communications with them? The answer is none. None more trust. For details on the public OpenPGP specification, see RFC 4880. This page is a perpetual work-in-progress. If you have questions, corrections, suggestions, tool suggestions, or want to exchange encrypted e-mails, please contact Alan Eliasen or on Twitter as @aeliasen. Thanks!